Students at Tees Alive, a Billingham-based service that supports people with learning disabilities to enjoy fun activities and develop valuable life skills, took part in the Stockton International River Festival Community Carnival this month. The annual festival is attended by thousands of people and features street theatre, dance and music productions from all around the world. Tees Alive is part of the national social care charity Community Integrated Care. The Tees Alive Drama Group have performed at the festival’s carnival parade for four years, and this year they were given a theme of ‘Big Headed Growly Animals’. The group was part of a select group of local community groups and schools that were given the honour of taking part in the carnival. The students prepared for the event over several months, developing new skills and experiences along the way. Their participation began when they met Morwenna Catt, the artist who devised this year’s carnival, who explained to students her vision for them taking part dressed as jungle animals, like snakes and tigers. The students went on to make their own costumes, inspired by Morwenna’s designs. Students also worked closely with the Urban Kaos dance group, who are based at ARC Stockton – the Stockton Arts Centre. Urban Kaos supported them to create their choreography for the performance – helping them learn both set routines that would be repeated throughout the festival, as well as develop improvisation skills. 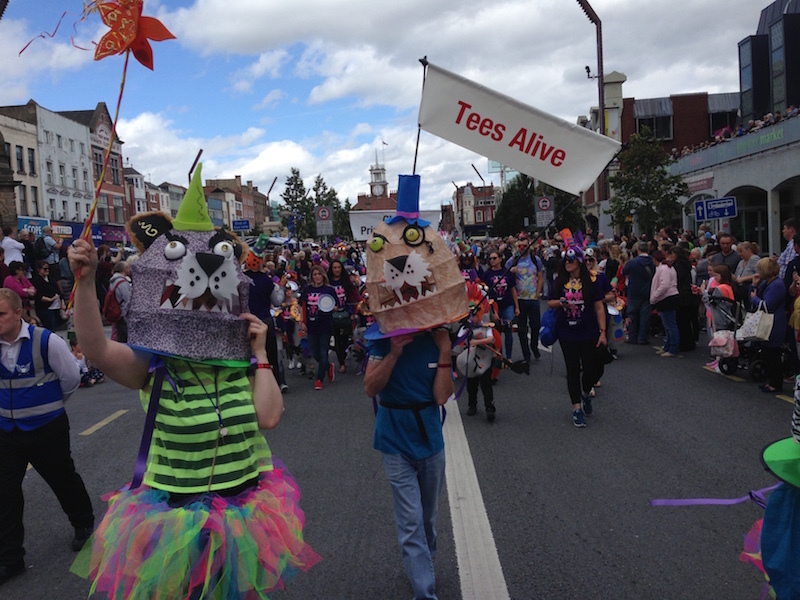 Eighteen people from Tees Alive took part in the festival, where they were cheered on by members of the public. They led the Carnival, and built excitement amongst festival goers by getting in character – dancing, chanting and growling to represent their animals. The carnival performance was closed with a large firework display. Be the first to comment on "Learning disability drama group takes part in International Carnival"